We understand how this program is used, so we knew better than to permanently bind it to any certain computer. You can use one license to unlock on two machines, but release one or both at any time to unlock on a new machine. Essentially you can play musical laptops with your two unlocks as often as you need, the only restriction is it just goes on two at once. 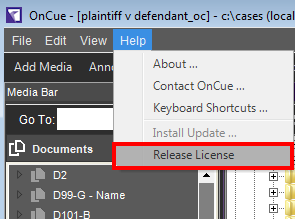 Under the help menu in OnCue, you can release the license on the current computer, making it available to put on any other machine. If you for whatever reason, no longer have access to both computers you've installed it on, it's easy to fix that too. 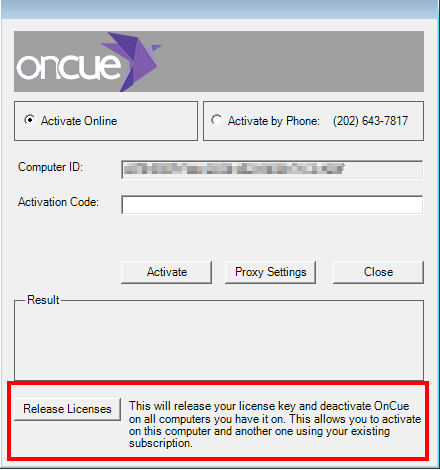 Just release your licenses with the button at the bottom of the activation screen and you're good to unlock on two new computers as long as your subscription is valid.